The first thing you should know about USFabricDepot: We are a division of East Coast Inc., NOT Shuford Mills. Outdura® Fabric, a Division of Shuford Mills. 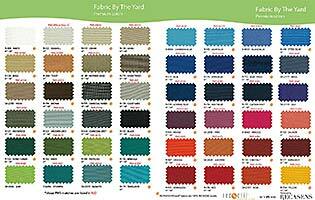 Outdura® performance fabric is manufactured and marketed by Shuford Mills. Shuford Mills is a leader in textile manufacturing for more than 125 years. Based in Hudson, North Carolina, Shuford Mills has a well-established reputation for quality woven products and spun yarn. They excel at exceptional customer service. They are one of the most respected names in the textiles industry. Shuford Mills was founded in 1880, giving the company a market presence in three different centuries. The textile leader established itself in the 19th century, while rising to prominence in the 20th century. Consequently, in the 21st century continues to consistently provide world-class products that speak to the needs of the marketplace. Because their dedication to innovation and improvement enables them to surpass the requirements of the marketplace. As a result, they anticipate customers’ future needs and wants. Outdura® performance fabrics is due to Shuford Mills’ visionary attitude. Outdura® Warranty: Shuford Mills warrants its 8-ounce Outdura® fabric for five years from the date of the original purchase and warrants its 9.25-ounce Outdura® for six years from date of original purchase. The Outdura® warranty covers the fabric becoming unserviceable as a result of loss of color or strength from normal exposure conditions, including sunlight, mildew, rot and atmospheric chemicals, if the fabric has been properly installed, used and maintained. The warranty does not cover labor and installation supplied by the dealer. The warranty also does not apply against deterioration of any kind due to abusive use, accidental burns, negligence, vandalism, perforations, or acts of nature.